Being from Iowa, where deer might as well be counted in the state’s population and now residing in the gun happy, hunting hungry South, I felt the need to join my kinfolk (people seriously still use that word) to mount a deer head on my wall. Now, I’m an avid animal lover (I feel badly when I see road kill and yell at people when they drive too fast through my neighborhood because we have chipmunks! Don’t run over a chipmunk for Christ’s sake! What would Alvin or Simon do without Theodore?). So there’s no way in hell I would ever hunt and shoot a deer (scarred from one terrifying incident as a 10 year old that involved me, my dad and a poor pheasant first with a head, then without), let alone eat Bambi, then stuff and mount, only to have its sad eyes follow me like a creepy, old, oil portrait painting in a haunted house. My hunt was less painstaking as the real deal but just as time-consuming. There was no camouflage to be worn, no tree stands to squeeze into and no 4am wake up time, however I couldn’t find my counterfeit piece anywhere. As deer season pressed on, I was left thinking I wouldn’t bag one (let alone three antlered bucks, which is the state limit in Tennessee) as I perused the flea market, scoured the shelves at local thrift shops and just knew someone’s grandkids donated a treasure of this magnitude to Goodwill upon their passing, only to end up with a lonely bit of wall space. Its pink sparkle catching my eye in the harsh fluorescent lighting. I quietly crept toward the beautiful creature (so as not to alarm other shoppers of a fabulous find), inching my way up to the shelf, carefully moving the camouflage of a shiny picture frame, a bedazzled mug and glittery candles it hid behind. And then BANG! My arm shot through the merchandise so fast, the deer didn’t know what had hit it before it landed at the bottom of my cart. Ladies and gentlemen, I had just bagged my first deer. How much more fabulous is this than the real deal? Beyond in my book. And a lot less messy. 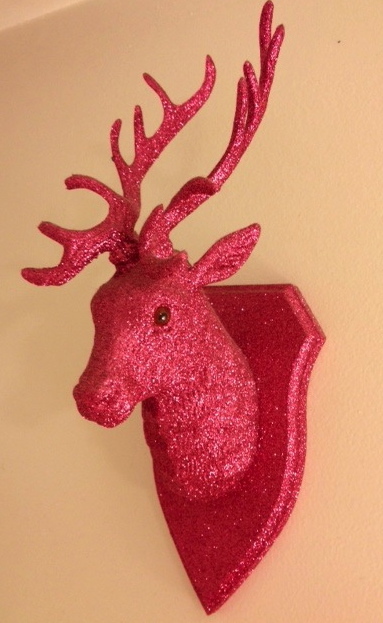 Deer decor, $9.99. TJ Maxx. I made my Iowa peers proud and staked my claim in the Southern soil, all with one hunting transaction. Plus, it’s one hell of a conversation piece, hanging above my toilet (I only wish I could hear the thoughts running through minds upon spotting it. I imagine they start something like “That crazy…”) as I display it like a trophy. And that my friends, is how you bag a deer. Sparkly style.